Description: This vintage-inspired wedding dress offers additional coverage to our original Ariella style. 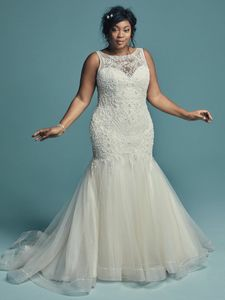 Bodice is accented in embroidered lace motifs, pearls, and Swarovski crystals, cascading into a tulle fit-and-flare skirt trimmed in horsehair and beaded trim. Double beaded spaghetti straps glide from illusion back to illusion halter neckline, both accented in beaded lace motifs. Finished with covered buttons and zipper closure. Tiered tulle veil edged in horsehair sold separately. *Veil pictured with Ariella, 8MC699.